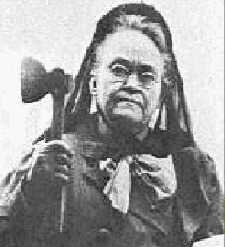 After marrying a promising young physician in 1867, Carrie Nation was horrified to see her husband destroy his career and his life after only two years. He drank himself to death. Mrs. Nation was so angry and disgusted with alcohol that she smashed up over 30 drinking establishments. This fearsome looking nearly six-foot-tall, 175 pound woman would enter a bar with such frenzy that all the male patrons ran in fright. She busted all the bottles and much of the furniture with rocks, bricks and a hatchet.